THERE was no waiting for a dental appointment when American singing stars the Osmonds visited Malvern. The band was in town to play a concert at Malvern Theatres when the wife of lead singer Merrill Osmond suddenly developed a tooth problem. The band’s tour manager rang Beacon DentalCare in Pickersleigh Road, where slightly startled receptionist Carol Ranford took the distress call in her lunch hour and booked an emergency slot. Within an hour dentist Karen Sutton stepped into the breach to help out Mary Osmond. Denise Purslow, dental nurse at Beacon, said: “The Osmonds were really lovely and down-to-earth. “They arrived a bit early, so I spent a while sitting with them and chatting. The Osmonds were so pleased their emergency visit had been arranged so quickly they arranged for four free tickets to that night’s concert for the Beacon Team. Karen Sutton, Beacon dentist, said: “I was so thrilled when Merrill Osmond pointed me out to the whole audience and said I was his dentist. 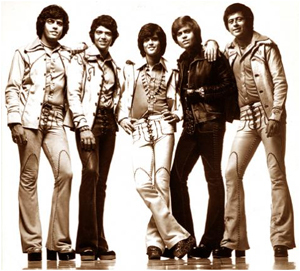 “I can’t believe I got the chance to hug a living legend, simply by helping someone in trouble with their teeth.“ Needless to say there are several new Osmonds fans among the Beacon DentalCare team. So, on their next visit, clients may well be treated to Crazy Horses, Back On The Road Again or Long Haired Lover from Liverpool on the waiting room sound system.